In a large bowl, combine your dry ingredients- almond flour, coconut flour, sugar, salt, and baking powder. In a separate bowl, mash a ripe banana very well, until it becomes paste like. In the wet ingredients bowl, add 4 beaten eggs, the almond milk, melted coconut oil and almond essence. Combine the wet and dry ingredients, mixing very well. Go ahead and pour the batter into a lined round baking tin and bake for 35 minutes at 350 F /180 C.
I picked up a bottle of Woodredding medium sweet cider at The Cider Shop while I was exploring the Wapping Wharf cargo shops the other week. This was lightly sparkling and not too dry, so very enjoyable to drink on its own. It’s also a sweet variety which is great to reduce when baking. On a medium high heat, combine the butter, cider, and sugar. Melt everything down and stir, stir, stir. You really want to make sure to keep an eye on it, constantly stirring at this heat, and having the patience not to raise the temperature too much. As the liquid and alcohol evaporate away, the mixture will thicken. I cooked it a little too long, but next time, I will stick to 20 minutes then reduce the heat for another 5 – 10. Let the caramel cool only slightly, then pour over the cake, smoothing it evenly over the surface. I was aiming for a caramel that wasn’t as thick so it would drip down the sides, but, you can’t have it all, eh? Top with sliced almonds and eat vigorously. And there you have it, Apple Cider Caramel Cake! It may take some time to make, but is sooo worth it in the end! And although my kitchen smells like a pub from the evaporated cider alcohol, my tummy is very satisfied. This is a great treat to make for garden parties or just to enjoy on your own as the weather gets warmer. It’s also a great way to showcase some of the wonderful cider the West Country has to offer. Pick your favourite sweet cider and have a go! Hope you all had a relaxing long weekend, and fear not, Spring is (probably) on the way! Thanks for reading and Happy Eating! 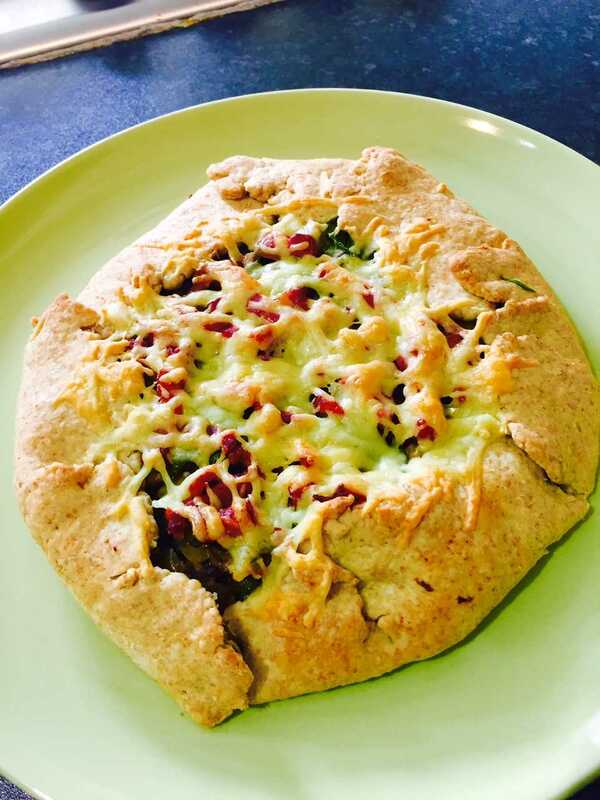 For last night’s dinner, I decided to make a galette topped with some of the single Gloucester cheese I bought at the Royal Three Counties show. 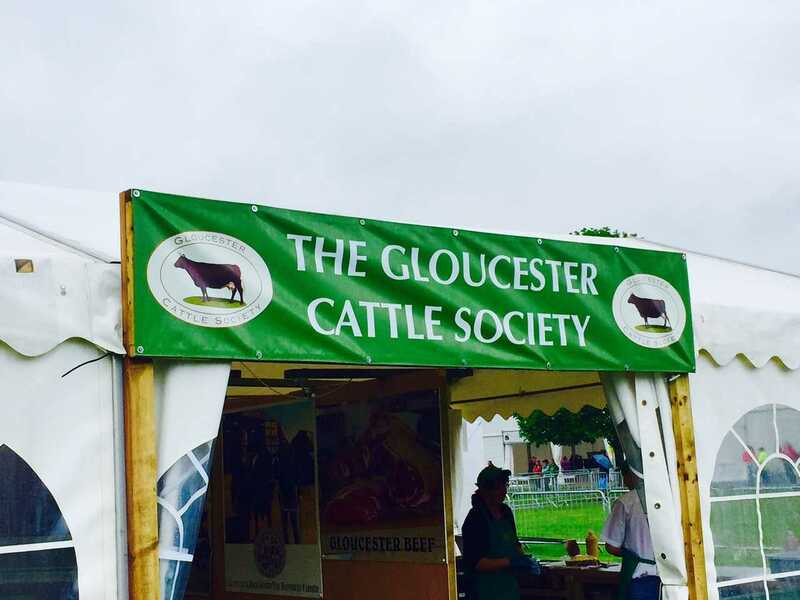 On Saturday morning, I stopped off at the Gloucester Cattle Society tent where they had cheese, cuts of beef, and sizzling burgers for sale. 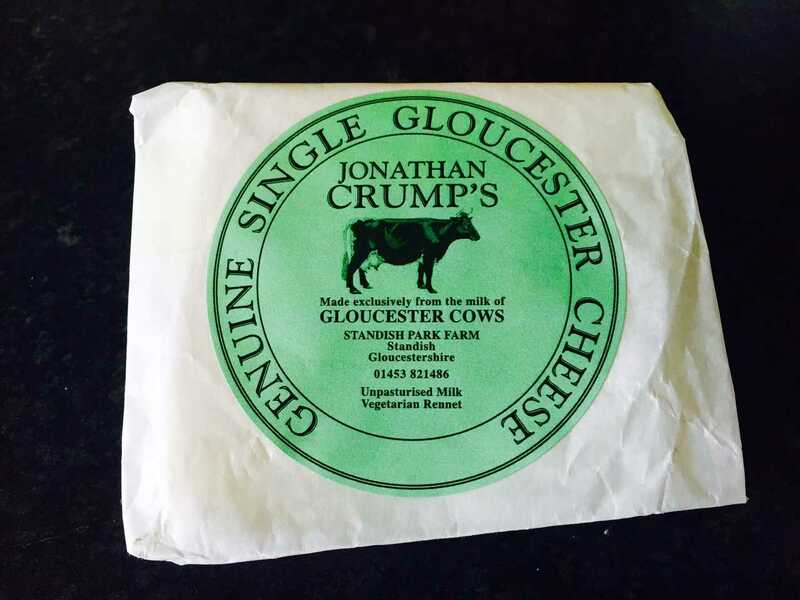 I decided to try some single Gloucester cheese as I’ve never had it before and doesn’t seem to be as readily available as double Gloucester cheese. I tried to find the difference between the two, and the website from the British Cheese Board sums it up nicely. 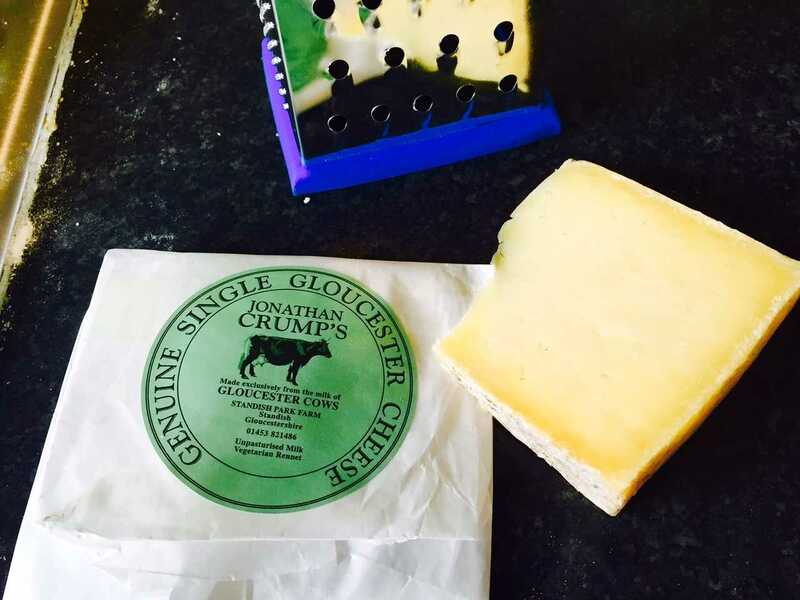 The distinction has changed throughout the decades, but now single Gloucester is only produced within the county, whereas double can be made and sold anywhere. 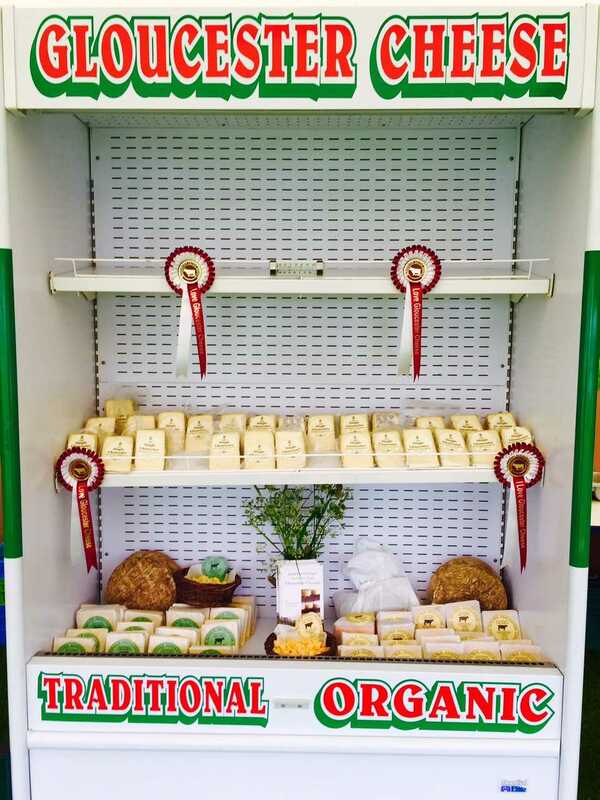 There were a few varieties for purchase, but I decided on a small wedge from Jonathon Crump’s cheese which was unpasteurized and organic. 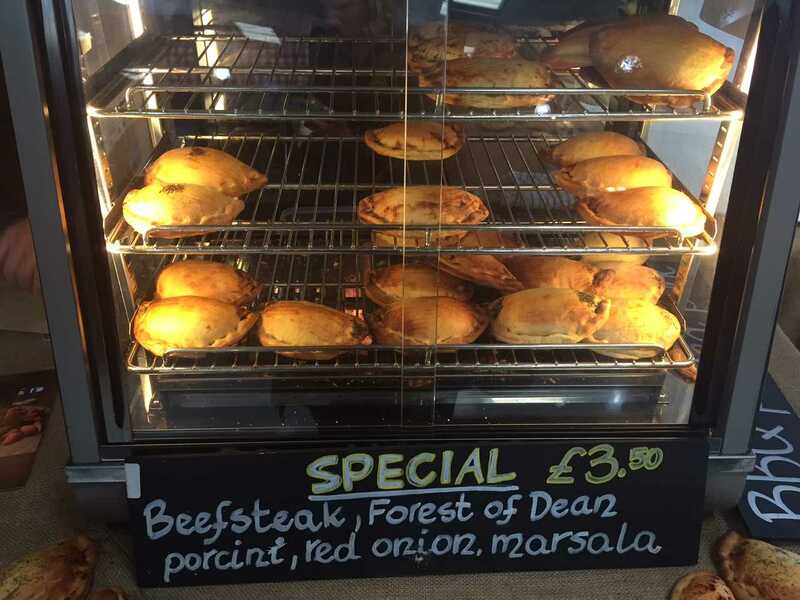 I couldn’t find a website for them, but the label states they are located in Standish, Gloucestershire. I decided to incorporate this cheese into a rustic galette as it was creamy, but not too sharp which would compliment the bits of salty pancetta I would put on top. Mix together the all-purpose flour, wheat flour, and salt. Incorporate the butter into the dough, mixing it with a pastry cutter or your hands until it becomes crumbly. In a separate bowl, whisk together the egg yolk, vinegar, and water (it will be a bit frothy). Add the liquid to the flour and knead until you have a smooth dough. You can add more ice water if necessary, a tablespoon at a time. 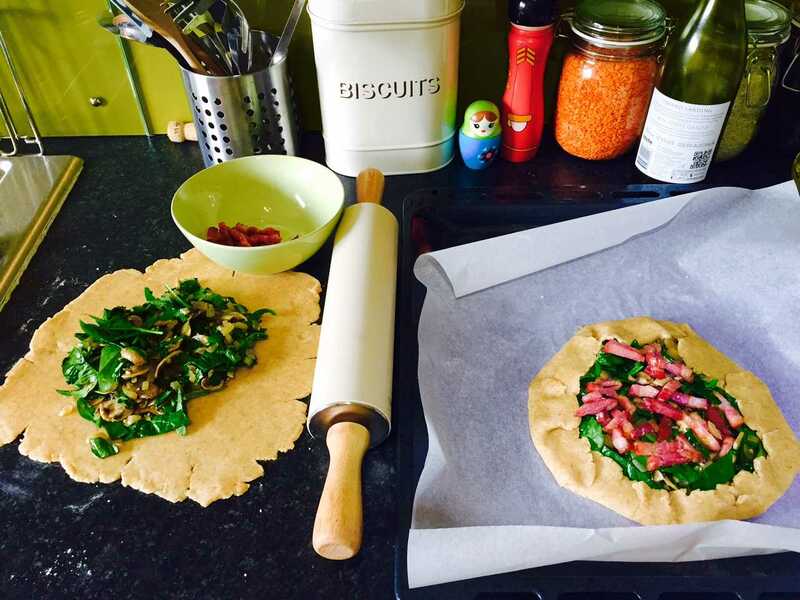 Separate the dough in half for two small galettes. You will roll it out before adding the filling, so you can cover the dough and chill in the fridge until its time to fill. Next, I began preparing the filling. 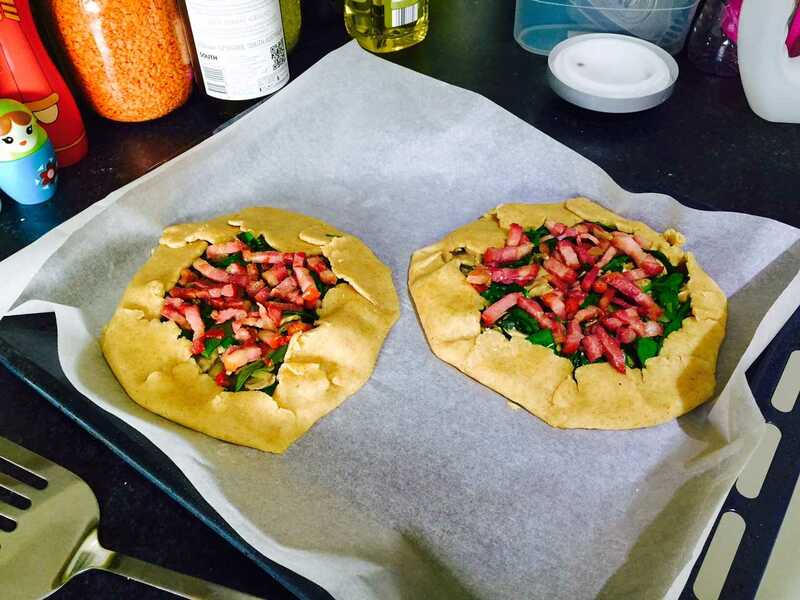 The best thing about galettes is that they are so versatile.They don’t have to look pretty and can be filled with anything, sweet or savory, and are perfect for when you don’t feel like using a pie pan. 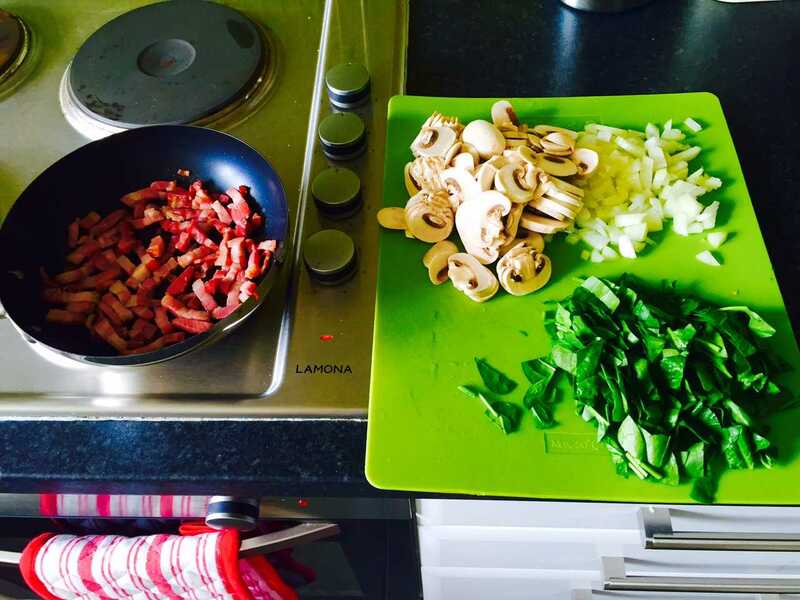 I decided to fill mine with pancetta (from Aldi), onions, mushrooms, and spinach. First I fried up the half a package of pancetta until cooked, then set it aside, leaving the oil in the pan. Then I sautéed the onions and mushrooms with a heaping spoon of chopped garlic. This stage will produce a good amount of liquid from the veggies. Too much liquid will give your galette a soggy bottom, so I reduced that to retain flavor. 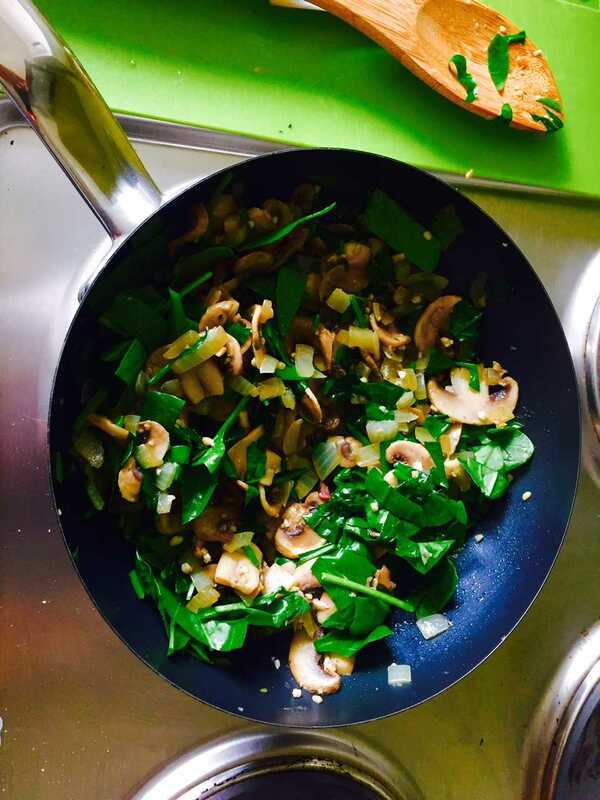 I then turned off the stove, and added the chopped spinach which cooked on its own from the residual heat. I preheated the oven to 210 degrees celsius and spooned half of the filling onto the center of each piece of rolled out dough. Spread the filling, leaving about an inch of dough around the galette to fold. It probably helps to put the rolled out dough on your parchment paper lined tray before you fill it, just sayin’. 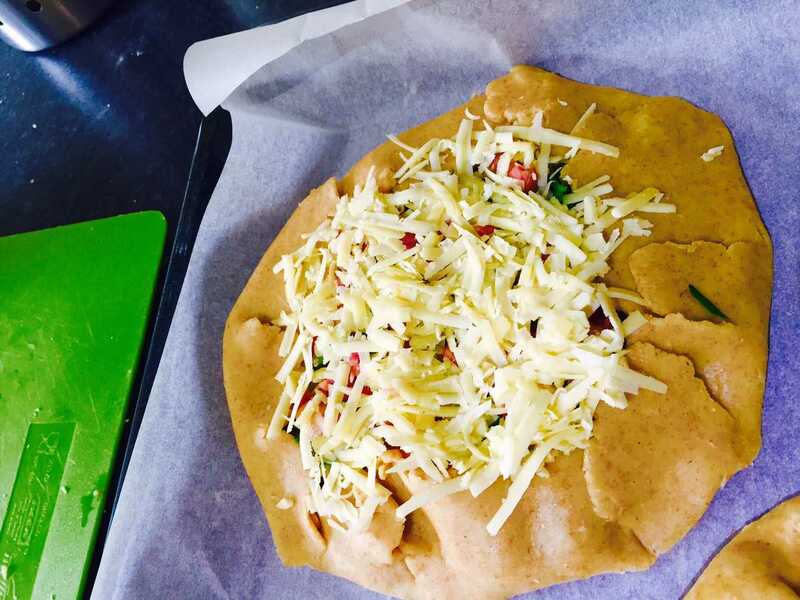 You then want to carefully fold up the edges of the dough a little at a time. The flattened dough doesn’t necessarily have to be perfectly round as it all gets folded up anyway. Next I grated the lovely single Gloucester cheese and smothered it over the top before putting the galettes into the oven for 20 minutes. The dough should be a golden brown, so a few more minutes may be necessary depending on what type of oven you have. I have a fan oven here in England, and 20 minutes was sufficient for a gorgeous looking galette! I also picked up a bottle of apple juice at the Three Counties Show. I don’t really drink juice, unless its orange juice accompanied by a shot of vodka. However, I tried a sample of what I thought was cider and it turned out to be one of the most delicate tasting juices I’ve ever had. 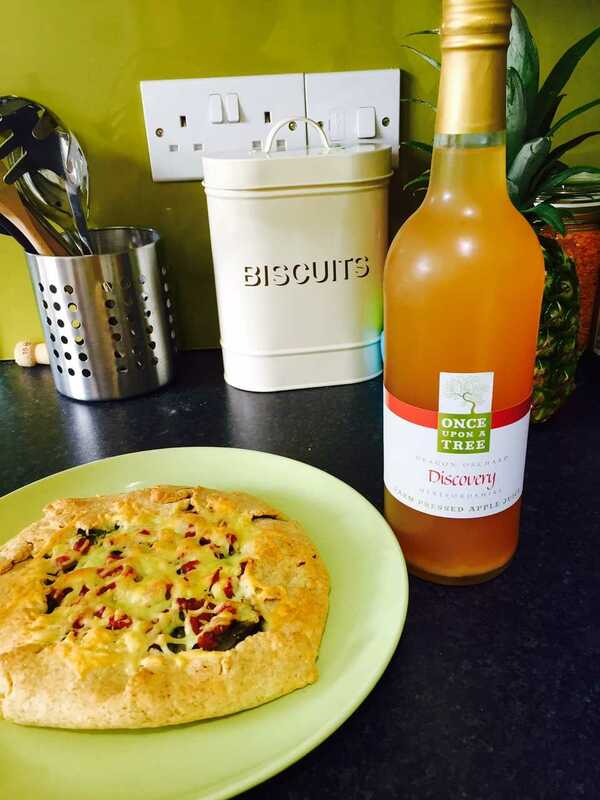 This juice comes from Once Upon a Tree located in Ledbury (HR8 2RG). They produce a nice range of juice, cider, and perry. This juice is made with the Discovery Apple, which is smooth and sweet, and not at all sharp and sour as some apple juices can be. Their products are available online, at really great prices, so I’ll definitely be buying this again. 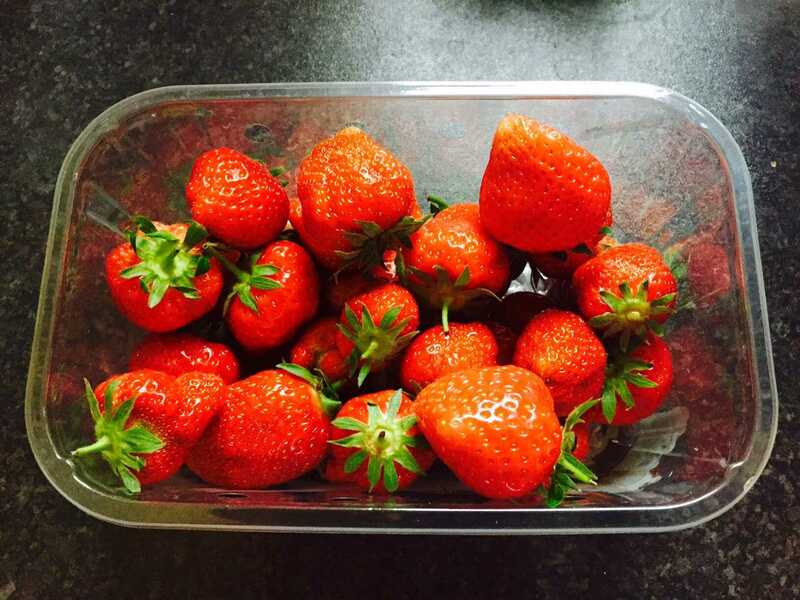 My meal was finished off by a punnet of Malvern strawberries bought before leaving the Three Counties show. 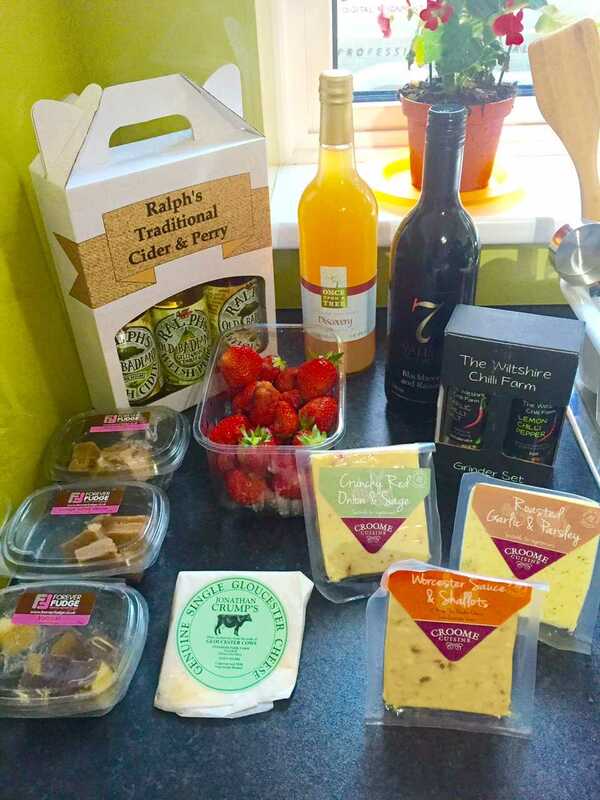 I’m heading to Cornwall this weekend to celebrate my two year anniversary and will be bringing along a bottle of wine also purchased at the show. Hopefully I’ll remember to do a quick post in between spending time at the beach. I’m hoping to find some Cornish products to use for future recipes, but next week’s recipe will probably be something with cider! 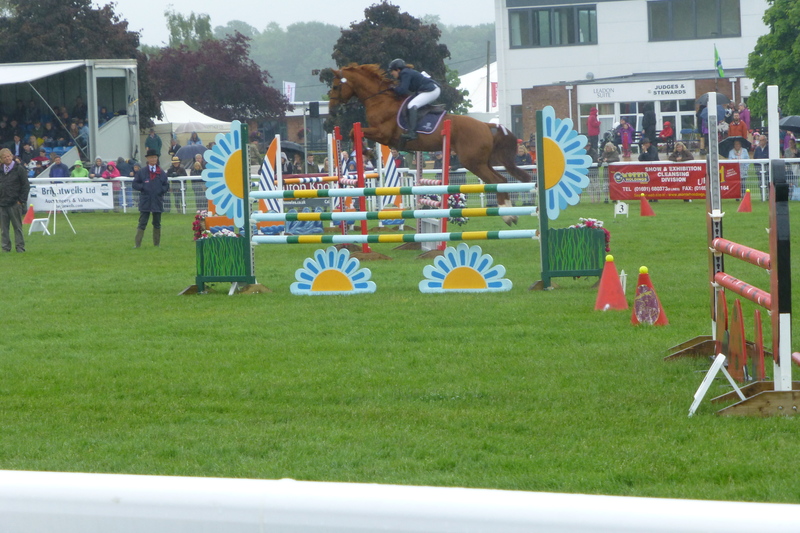 I had quite a day at the Royal Three Counties show yesterday and barely know where to begin. 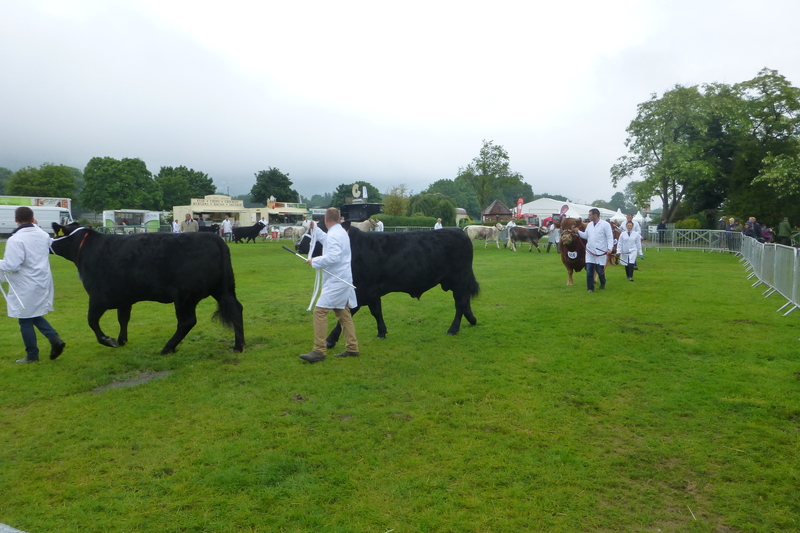 Despite a rainy start, the grounds were packed with people buying, selling, showing, and shearing! 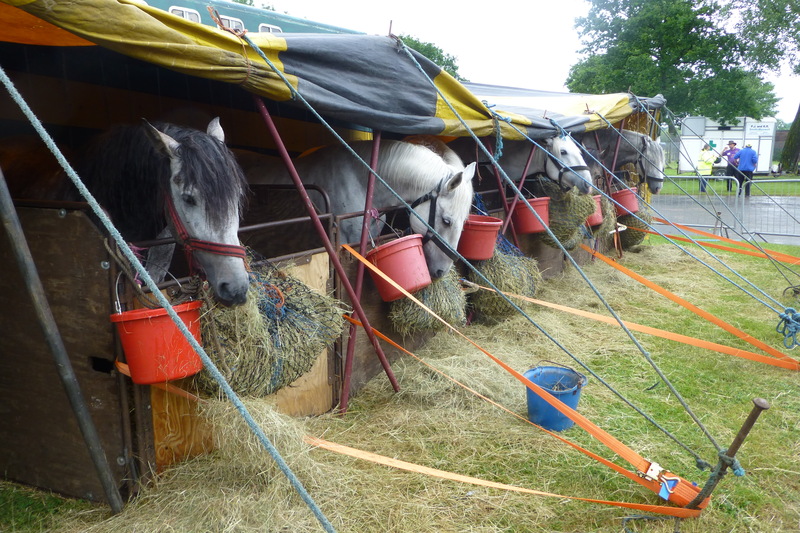 First off, the grounds covered lots of yardage with areas reserved for the horses, cattle, sheep, with pens to showcase each. The main arena at the very north of the grounds featured the dressage, horse and carriage showings. The area adjacent to the south entrance featured a lot of the sheep and cattle showings, along with the sheep shearing competitions which was a highlight for this city girl! Seriously, shearing that wool is tough work, but these guys made it seem almost effortless as they worked on 8 sheep during the early stages of the competition. 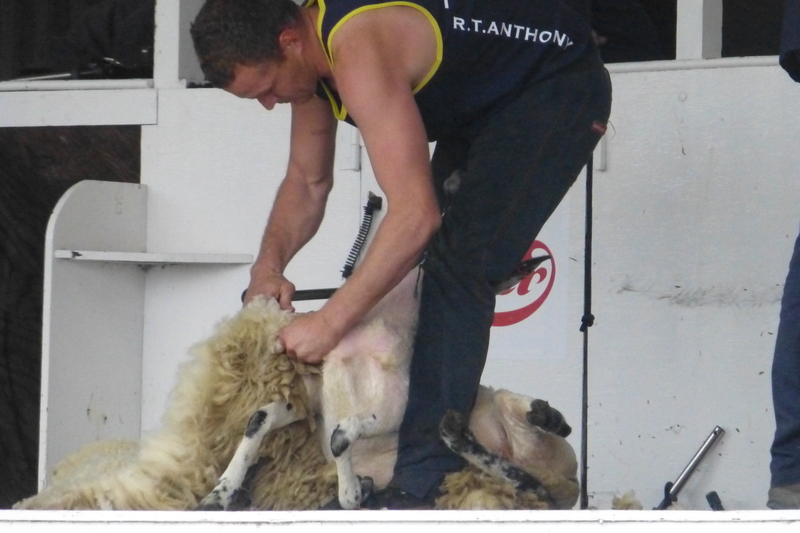 Can you imagine shearing a hundred or more in a day? Anyhow, onto the food and drink, which were the things I was looking forward to the most. However, I was so in the zone, that I forgot to capture and record some of the food I had eaten. Halfway through my first scotch egg ever, I realized I should probably take some photos and write some things down. So, today’s post will go over a few of the things I ate hot and ready. A lot of the suppliers have an online presence, so if you see something you like, check them out and tell ‘em you found them here, on Bristol is Home. OK, so that scotch egg. I love eggs and sausage and all things fried. However, since my first visit to England in the summer of 2002, which included exploring Scotland, can you believe I’ve never tried a scotch egg? Yeah, me neither. So when I saw The Handmade Scotch Egg Co Ltd display, I had to try one. The toughest part was choosing as they had tons of variations of the classics, some with spicy tones, and even one with whisky. However, I decided to try the “Monty” which featured dry cured ham wrapped around the egg, which was then surround with free range pork. Sorry if the pic isn’t too photo worthy; I was almost too busy devouring it before I realized I was supposed to be reporting on it too! 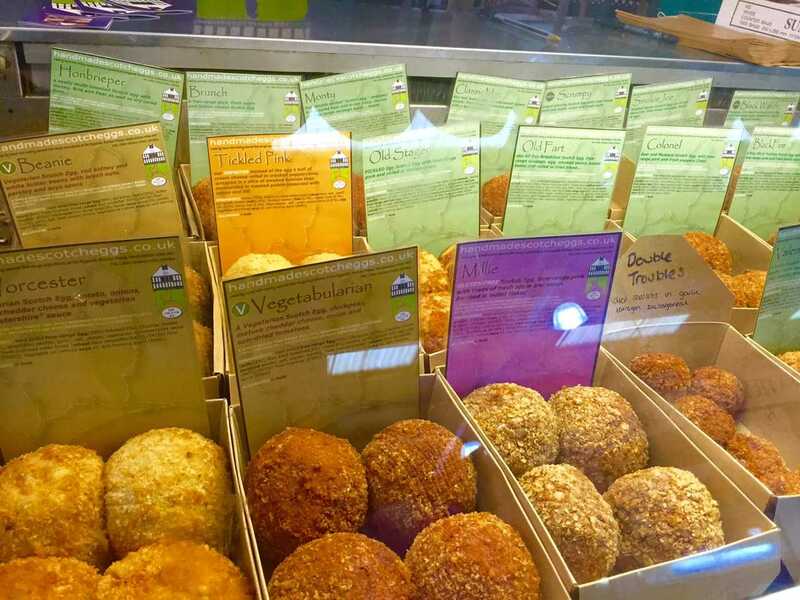 The Handmade Scotch Egg Co. can be found at two places: Egg’cetra (the first ever Scotch egg shop), 14 Friar St, Worcester, and The Nest (their headquarters), Hereford Rd, Ledbury. You can also shop online at: handmadescotcheggs.co.uk, and check out their facebook page here. What I ate next isn’t English, per se. However, when you consider the diverse multicultural fabric that comprises the UK, and that I went to school in Indiana where pierogis were served in the dining hall, I knew I had to try one of the Old Granary’s huge pierogis. 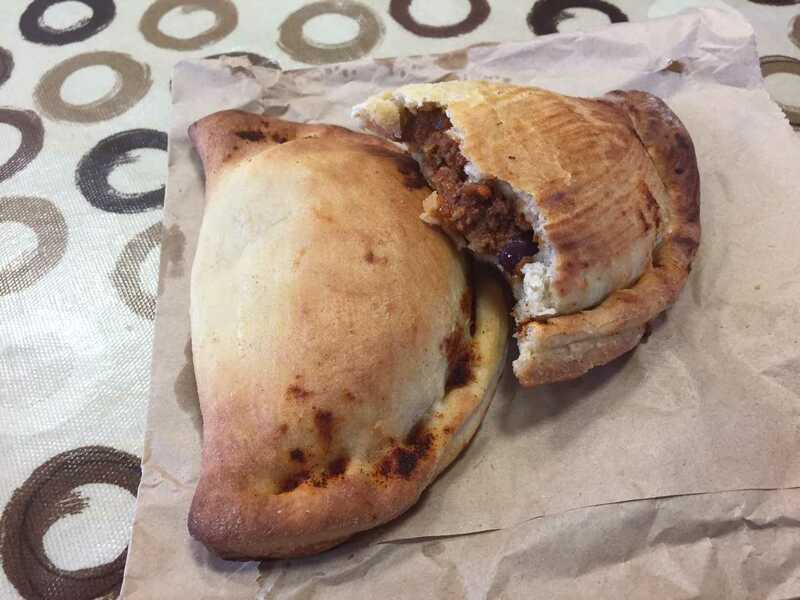 If you like pasties, then you’ll like this traditional Polish treat too. These handheld parcels feature savory fillings encased in a yeast dough. 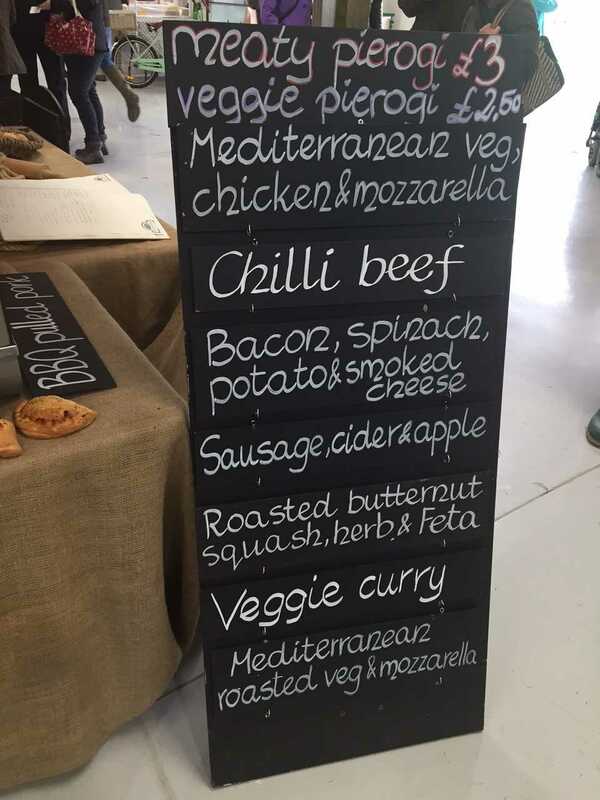 I chose the chilli beef, although to be honest, I could have easily eaten each one they had on offer. They are located in Herefordshire (Marden, 10B Walkers Green, HR1 3DN) and also have a facebook page here. 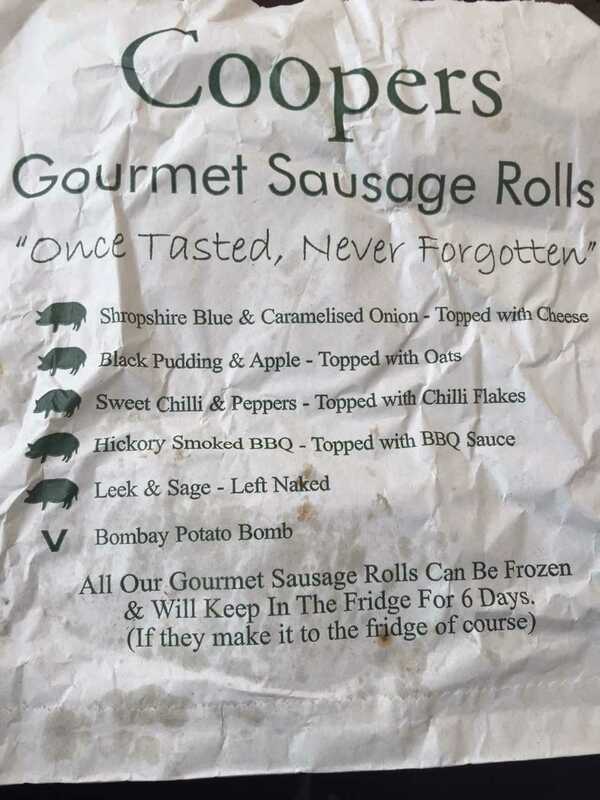 Next was my favorite of all the savories I tried: a good ol’ sausage roll straight from Cooper’s Gourmet Sausage Rolls (link) in Shropshire. 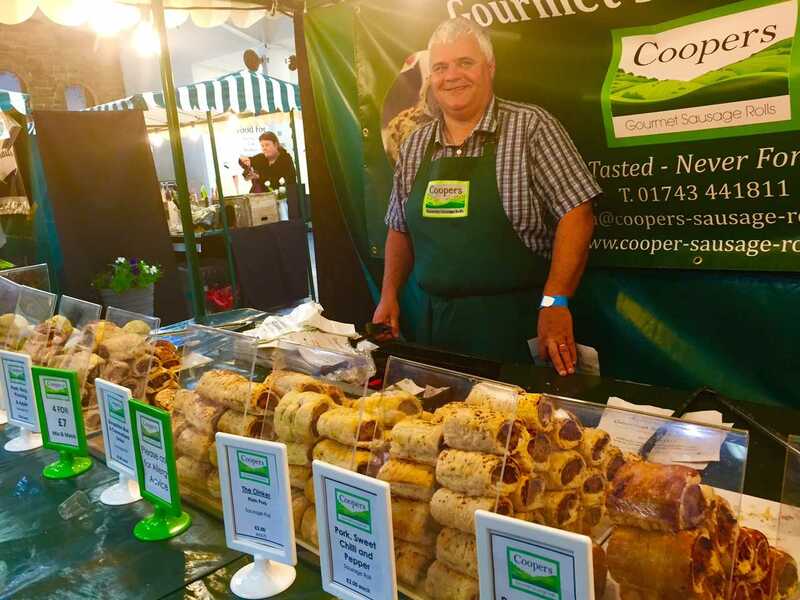 These sausage rolls were stuffed with generous heapings of tasty meat and were such a great price (2 pounds each at the show) that I had to try two. The Peri Peri was spicy with the perfect level of kick, and the Hickory Smoked BBQ was so flavorful, that if you closed your eyes, you’d swear you just grabbed it off a table in Texas! They really were that good, and I’m kicking myself for not buying more to take home. 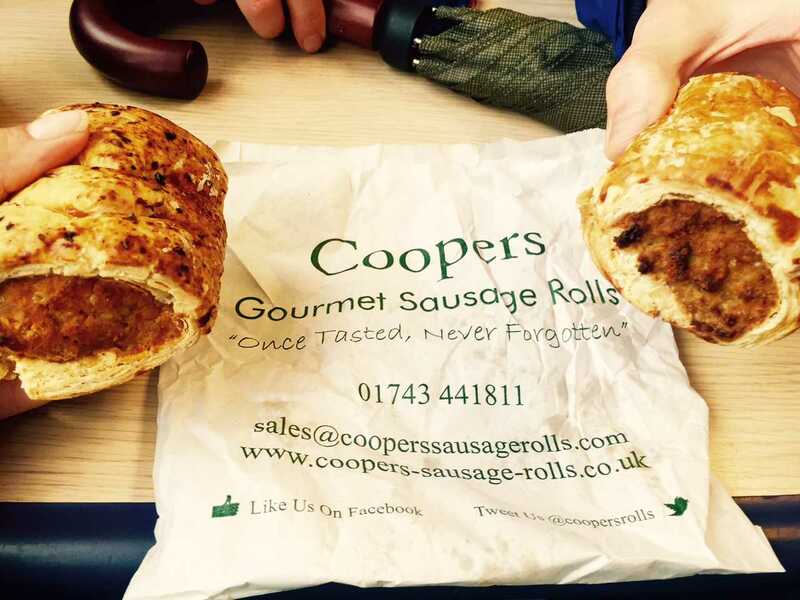 They currently deliver to tons of shops and delis, so check them out online to see if you can find some near where you are: www.coopers-sausage-rolls.co.uk and don’t forget to check out their facebook page here. To end today’s post, will be some chocolate I bought with the loose change I had left in my pocket. 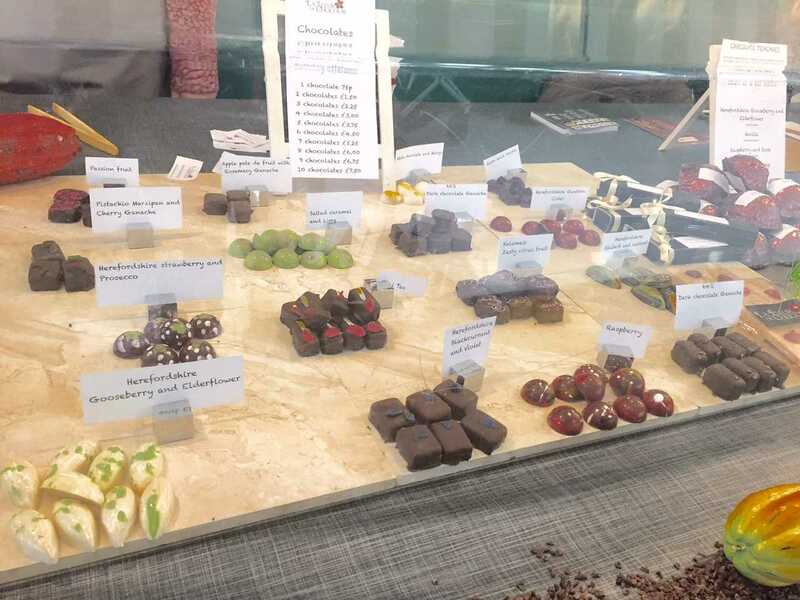 I wanted to focus on local flavors, so the Herefordshire Gooseberry Elderflower and the Herefordshire Gwatkin Cider flavors from La Fleur de Chocolat caught my eye. The cider truffle had a smooth filling inside that featured a hint of sharpness you might find in a good cider surrounded by good quality chocolate. Again, this is just a small sample of what I ate. This show was such a great day out, that I’m already planning a return for their Autumn festival later on in the year.